A gas pump next to Fly 'n' Buy store. For the four month anniversary of this blog, I present one of those photos that doesn't really come with an explanatory post or history. 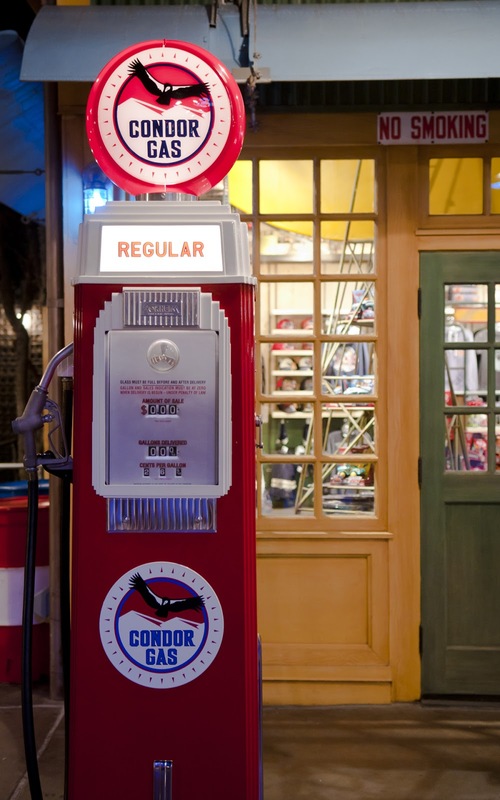 This is more of a detail shot over in Condor Flats of a piece of theming that I've often felt was one of those really nice little touches that make a Disney park so nice. 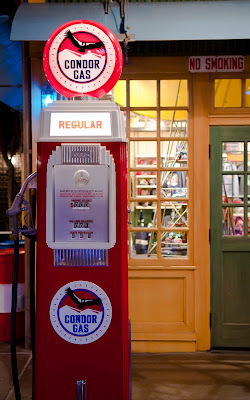 One of two that stand outside the Fly 'n' Buy souvenir store, across the path from Soarin' Over California, this Condor Gas pump calls back to another era. And it's so vibrant and pristine too! That's what really caught my eye the night I walked past and finally decided to take a picture of it. The design and lines are very nostalgic, and the crispness of the scene conjures a very pleasant feeling. So really, I guess what I'm trying to say is that there's no real compelling reason for this photo, other than I think it happens to be very nice. Sometimes, it's that simple.